We are a company located in South Carolina and have been in business for over 25 years. 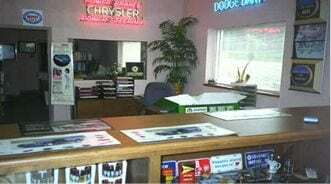 We sell new and used parts for Chrysler Corporation vehicles only, mainly 1955-95 models. Approximately 70% of our sales are new Chrysler parts (genuine MoPar parts) and 30% are good used parts pulled from our large selection of parts cars located on the premises. Our main warehouse is well stocked from floor to ceiling, two levels in all, with new old stock parts. The best analogy for our market niche is your local Chrysler-Plymouth-Dodge dealer. We offer the same high quality parts; only more! We also have parts for your 1981-83 Imperials. Think of Brad's NOS Parts as your local dealer accessible through a "time machine". If you were able to go back in time to 1975 (remember disco? ), you could walk into your friendly local Dodge dealer's parts department and order most any new genuine MoPar part for your 1969 Dodge Coronet. Think of us today as that same dealer's parts counter then. We may have that same new genuine part on our warehouse shelf today, but add 30 years of dust!! We leave the reproduction market to other companies and key in on the good stuff! One of the most common questions we get is: "Where in the world do you get these parts?" To answer where we get the parts is difficult. It's easier to explain how the parts exist in the first place. Let's say your daily driver is a 1995 Lebaron convertible. The kids break the left convertible top latch and you order a new one from the local dealer. Later you discover you can fix the latch yourself and don't bother to go in and pick it up. Meanwhile 4 weeks go by and your local dealer realizes that you are not coming in to buy it so he "puts it upstairs" figuring he'll need it sooner or later. Twenty years later, he still has it upstairs only with a layer of dust on it, and we now have a 20-year-old NOS part for someone restoring a 1995 Lebaron. Most of our inventory was purchased years ago when the parts were plentiful. Many times a customer will call and after we verify that we indeed have the needed genuine MoPar part, they will respond: "Do you know how many years I have been looking for that?" Word has it, "If we don’t have it, no one does!" The parts we have inventoried only represent approximately 20% of the NOS parts we actually own and have here. As well as our incredible inventory of new parts, we have many parts cars here. If you don't see your part here, please call, email or write us, or use the General Parts Inquiries Section of the website. Chances are we can find it for you. Your freight costs will include the shipper’s charge (UPS, USPS, etc) and a handling fee. All shipping costs will include adequate insurance. All shipments are insured for the actual value. Most orders are shipped via UPS Ground service unless otherwise requested. We must have your complete street address, as UPS will not deliver to a P.O. Box. UPS will attempt delivery three times (three-week days in a row) and will then return the package to us. If no one is available on the first attempt, UPS will leave a card at the door with further instructions for delivery. Please follow their instructions. Items returned to us because of non-delivery will be charged a handling and re-delivery fee. The minimum charge for any order shipped via UPS is $13.50 whether you order one item or twenty. To save on shipping charges, order several items at once. Canadian and International orders are normally shipped via USPS depending on dimensions and weight of your order. You may call or email for a shipping and handling estimate. Parts too large for UPS (fenders, etc) are shipped by truck freight. Truck freight charges are reasonable and relatively quick in delivery. Please call for a quote. All prices are subject to change. Due to the nature of these parts, price and availability on any item can change overnight. We will strive to keep prices accurate on this website. If any part has a price of $0.00 it does not mean it is free. It simply means that a price has not yet been entered. This inventory represents approximately 20% of the NOS parts we actually own and have here. Most of our inventory was purchased years ago when the parts were plentiful. With the manpower unavailable and as busy as we are, it will take years to finish inventorying everything. New additions are always coming in. Backorders:Items that out of stock at the time that your order is processed will be back ordered. As soon as these items are available, your back order will be shipped the next business day. Your invoice will note any item that is backordered. Most backordered items take less than ten days to fill. Should delivery take longer than expected, you will be notified by email. You have the option to cancel backordered items at any time and receive a refund. Special Orders and Used Items:Special order items and used parts will take anywhere from 2 to 3 weeks before being shipped. Please take this time factor into consideration when ordering. Special order and used parts are also subject to a strict return policy. Mistakes Happen:Each shipment will have an invoice included within the package. This invoice lists everything in this shipment plus a complete listing of all items backordered. Please check your invoice carefully. Each order is checked for accuracy before being shipped. We make every attempt to avoid errors in pricing and product information, but we are human. If a mistake does occur, we reserve the right to correct it and we apologize for any inconvenience it may cause. Please be careful when unpacking your shipment so that items are not overlooked and/or thrown out along with packing material. Return Policy:Of course, we want you to be completely satisfied with your Brad’s NOS part. Please call or email us to discuss any dissatisfaction before shipping back your order. Returned parts must be in the same condition as they were sent out including original box or wrapper (MoPar container). No refunds will be issued without a copy of the invoice. Any part that has evidence of installation or tampering is non-refundable. Items must be returned with 30 days of receipt for a refund, credit or exchange (minus shipping and handling charges). Except for damaged (not shelf wear or manufacturer cosmetic flaw) or misshipped parts, ALL returns are subject to a handling and restocking charge. We are not responsible for incorrect parts resulting from customer supplying incorrect parts numbers. Once an order is processed it may not be canceled. If customer cancels a store credit only will be issued. Drop shipment charges will be effective as of August, 2009. These charges will not be waived for any reason or customer. These charges were put in place to cover the increased cost of shipping and handling fees. Shipments are subject to Residential delivery charges, so please provide a business address for your customer whenever possible. All Drop Shipments must be prepaid. We will not Drop Ship COD packages. Your customer will receive a packing slip with your company information.